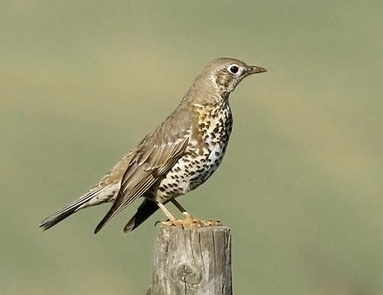 Both Song Thrush and Mistle Thrush are widespread resident breeding birds on Arran. From the recently published Arran Bird Atlas 2007-2012 the distribution of both species is stable but how do you tell apart these birds, which both have spotted breasts? Here are some pointers. 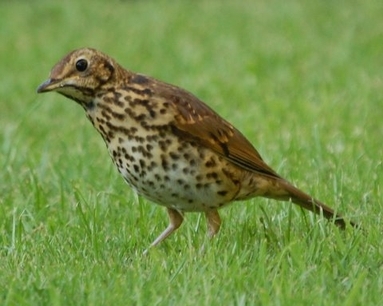 The Song Thrush (image on right) is the more familiar thrush, common in gardens. More retiring, less demonstrative than Mistle, preferring to keep within easy reach of cover. The Mistle Thrush often occurs in pairs or small parties in larger gardens and open countryside. In appearance the Song Thrush is more compact and evenly proportioned than Mistle with warmer brown upperparts and rather buffy underparts, rather less boldly spotted particularly on the flanks. On the other hand the Mistle Thrush is a bold, upright, more long necked thrush, much greyer brown above and more boldly spotted below, particularly on the flanks. The folded wings have noticeable pale edgings to the wing-coverts and tertials. The white tail corners in the Mistle Thrush are obvious in flight. Their songs differ as well. The Song Thrush has a loud clear song consisting of a varied series of repeated phrases, delivered with great gusto, often from a prominent perch. The Mistle Thrush song does not have the repeating phrases of the Song Thrush. It has a more wistful mellow song with a series of disjointed phrases. The Mistle Thrush also has a distinctive loud, grating, often persistent alarm call. To sum up. The Mistle Thrush is much greyer and more upright than the Song Thrush. If you see them together Mistle Thrush is bigger than Song Thrush. Song Thrush is a little smaller than Blackbird but Mistle Thrush is a little bigger than Blackbird.